Today’s post addresses the social media DOs and DON’Ts for companies that want to keep up with their engaged community, while using social media tools such as Twitter properly. How can social media marketing help with crisis communication? As the tweet by Starbucks’ UK manager suggests, social media can be used in various ways to respond to clients. But is answering Armando Iannucci a good use of a manager’s time? What we do know is that having clean lavatories is part of good customer service. And when the men’s toilet is broken, the women’s toilet gets twice the usual traffic, and should therefore be cleaned accordingly. While visiting the Starbucks in the Potsdam pedestrian zone last weekend, I noticed the men’s toilet was broken and the one for women looked like a pigsty. 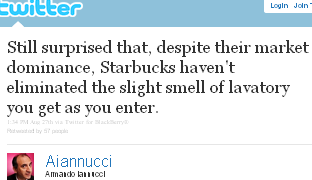 The above suggests that the toilet challenge is not limited to the franchise Armando Iannucci visited in the UK, but more widespread across Starbucks outlets. 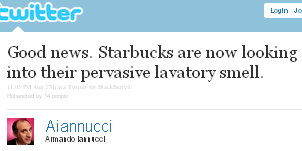 Maybe instead of answering tweets, Starbucks’ manager needs to institute a policy that ties performance-related rewards to keeping stores – including their toilets – up to acceptable standards. Responding to clients that may have smelled something off is one way to burn time while using social media. A better way might be enforcing proper policies to make sure such facilities meet sanitary standards expected of a place that serves food and beverages. These days, the Internet and Web 2.0 can be unforgiving. Being cautious and having your mouth check in with your brain before making statements or off the cuff remarks is what we expect from media savvy CEOs. Former BP CEO Tony Hayward saying on-camera that, “I’d like my life back,” (see short video below) was the beginning of his downfall as the public was outraged by his remark. From now on, “I’d like my life back,” will likely be one of the 10 social media flops included in any communications studies handbook or those offering cases on this issue. In the classical sense, the communications department is dead. Accordingly, spending money on producing a PR-type video may backfire. 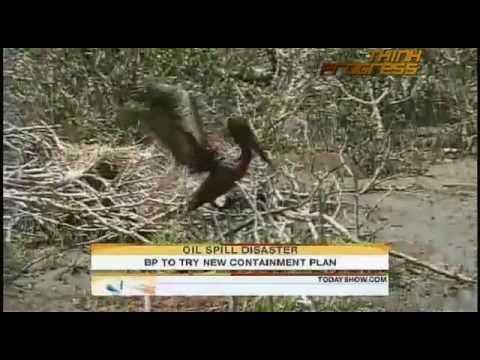 Ending a video produced to boost BP’s image with, “We will make this right,” was outright arrogant if not plain stupid. In the public’s mind it was impossible that paying for the clean-up could ever make the fact that BP had let the Deepwater Horizon oil spill happen ‘right’. Today’s social media savvy customers no longer go for such schtick or smart comments. Resource: How BP shrugs off negative reviews – or are customers stupid? Don’t miss our next post! Provide your email and get it delivered to your inbox first; you’ll be glad you did. As the Starbucks example illustrates and given that using social media is time consuming, focusing on critical matters is vital. Nor are a CEO’s off the cuff remarks that raise the public’s ire helpful. PR videos are useless if they are trying to make a company look good after it clearly made a huge mistake, such as allowing the Deepwater Horizon disaster to occur. Online, such mistakes can result in a negative publicity avalanche. But if you decide to use micro-blogging or produce videos, make sure the content matters to the target audience. “The post-Tharoor MEA now sounds like a dumped girlfriend trying to make intelligent conversation,” (see Tehelka – The upper lip Twitters stiffly). If you cannot add value through a social media channel, it is unlikely to be used as a good and reliable source of information in a time when you need it most – trying to manage a crisis. India’s MEA should take heed. An effective use of social media can include gauging customers’ opinions, but managers must develop a strategy, ensuring that it is simple and properly implemented to minimize time-wasting by answering customers’ comments on Twitter or Facebook (see Apple has discovered that language can be simple and…). Also, refraining from saying stupid things on TV or in a PR video helps, as the BP case illustrates. Finally, offering a social media channel for bureaucrats to pass the time with useless tweets cannot be a smart use of scarce taxpayer revenue, can it?